One of the most effective exercises for increasing overall strength with a huge focus on grip strength is the Farmers walk, or Farmers Carry. Here is a video of an extremely strong man performing a short walk with about 680 lbs. The benefits of the Farmers Carry include increasing overall strength, grip strength, core and much more. Here is a video of my buddy doing a Farmers Walk outside the Local Gym in Ocean City, NJ in June, 2018. The handles look to be homemade by someone who knew how to weld. Super heavy duty! What exactly is a farmers walk? It basically involves picking up very heavy objects and walking with them and then putting them down. Not only is this a common strongman competition event, but performing Farmers walk exercises can be quite beneficial to your strength program. Developing a strong grip is crucial to increasing your other lifts. What Muscles Benefit from the Farmer’s Carry? Muscles that are worked with this exercise include traps, forearms, core, delts, and upper back among others. Pulling strength is increased and overall work capacity is increased. In addition, your entire nervous system gets a great workout, and due to the heavy workload, growth hormone release is increased, helping to grow muscle in your entire body. This is a brutal workout that recruits not just a boatload of muscles, but your nervous system and cardiovascular system as well. This will whip you into shape like few other exercises! If you want an exercise that will get your heart rate going, trigger a huge testosterone dump into your bloodstream, challenge your grip strength, and work just about every muscle in your body all at once, you need to try the farmers walk exercise. 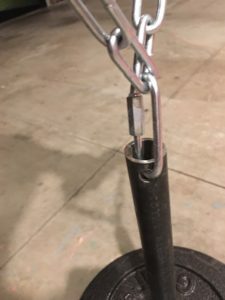 Where Can I Get Farmers Walk Handles? Farmers carry handles come in many different varieties, from homemade to full-size farmers carry bars made by various manufacturers. I first became interested in making my own farmers walk handles after working out at the local gym in Ocean City New Jersey. 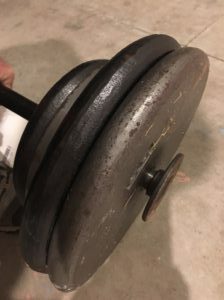 They had a pair of handles that were obviously made by someone who knew how to weld and as I used them I instantly wanted to have some of my own in my home gym. If you like to make your own gym equipment, see my article on Forearm Training and Making your Own Wrist Rollers. These are another great tool to increase grip strength and forearm size. I did not know at first the exact sizes of the materials I would need, so I bought a 3 ft length of threaded pipe (threaded on both ends), 2 foot lengths of PVC and 10 feet of chain and cut them all to length. I use 1″ weight plates, so that is why I use 1″ O.D. threaded pipe. This is critical for the 1″ weight plates to fit on the pipe. You can certainly use 2″ plates with this set-up, they will just have more play but that should not be a problem. Or you could use 2″ pipe and flanges instead. When selecting chain and Quick links, be sure thy are rated for at least a couple hundred pounds of working load to be safe. I like 2″ handles because this makes it much more challenging for the grip. You can use smaller diameter PVC for the handles if you want the focus of the exercise to be less on grip and more on a total body workout. PVC and the threaded pipe can be cut by hand with a hack saw. The chain can be cut the same way, but I prefer a dremel tool with a cut-off wheel. However, most hardware stores can cut you a piece of chain to whatever length you need. Since my basement gym is not very big, I do the Farmers Carry on the driveway after each workout. 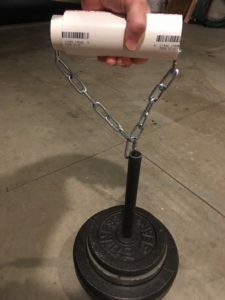 I started with 50 pounds of weight on each handle, and just walked as far as I could, to a rest, then picked them up and continued until exhausted. After a week of that, I started increasing the weight a bit. I have noticed that my grip strength has increased noticeably in just a few weeks! Always be sure you are getting enough protein to support your training. Muscles grow with Protein! !